Join Us In 2019 To Celebrate 75 Years! 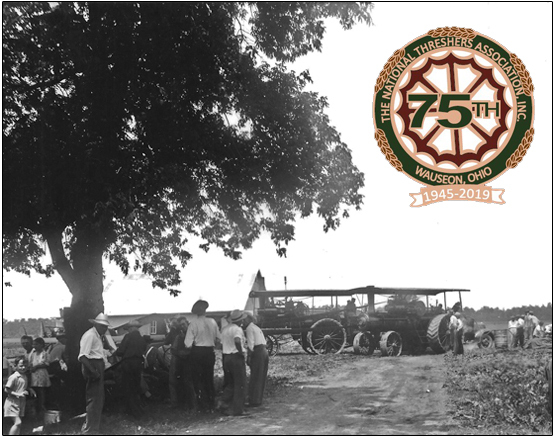 ...the 75th Annual National Threshers Association (NTA) Reunion, June 27 - 30, 2019, at the Fulton County Fairgrounds north of Wauseon, Ohio. Featured equipment manufacturers will be Port Huron and Caterpillar, along with Novo gas engines. The first gathering of what would later become the National Threshers Association took place on June 30, 1945 at the farm of LeRoy Blaker, outside of Alvordton, Ohio, in the northwest corner of the state. His three Port Huron steam engines were in use at that initial event, which was attended by 300 people. The photo on this page was taken during one of the early reunions at the Blaker farm. The show moved to Montpelier, Ohio in 1953 and then was relocated to its current location near Wauseon, Ohio in 1965. Each year, the NTA show typically showcases about 50 steam engines, in addition to hundreds of gas tractors and gas engines. Daily demonstrations include threshing, sawmill, shingle mill, veneer mill, plowing and machinery parades with covered grandstand seating for spectators. Other highlights include antique tractor and steam engine pulling displays, operator skills contests, evening spark shows, prony brake horsepower testing, Baker fans, power eater and much more. Air-powered engines displays are also featured, along with photos and memorabilia displays dating back to the reunion's first show in 1945. Official National Threshers Association shirts, as well as other commemorative items to celebrate the 75th Anniversary, are available under the grandstand throughout the show. An extensive flea market features tractor and steam engine parts, authentic and reproduction manuals, antique and new tools, collectibles, signs, decals and a wide variety of other items. For more show information, including the schedule of events, directions, lodging options and future show dates, click here. Do You Know Someone Who Went To An NTA Reunion At The Blaker Farm? People who attended the NTA Reunions at the Blaker Farm (1945 - 1952) will be recognized before the parade on Saturday, June 29, 2019. To be included in the festivities, please email Dennis Rupert, rupertcull@comcast.net, and be sure to check in at the announcer's stand before the parade begins. NTA's annual pre-reunion potluck dinner will be held Sunday, April 14, at 12:30 p.m. in the Junior Fair Building at the Fulton County Fairgrounds. Posters and handbills will be available, and camping and memberships for this year's show can be purchased. Campers...Stay With Us. It's Economical And You Won't Miss Anything! There's no need to miss any sights and sounds of the NTA reunion if you stay the week with us. The Fulton County Fairgrounds has over 400 camping sites offering grassy level accommodations (some shaded), 30 amp electrical service, potable water and a modern dump station. Amenities include modern bathrooms (with family bathroom) and showers. Camping is open to show attendees and exhibitors on a first come - first served basis. The rate for Monday, June 23rd, through Sunday, June 30th, is only $100, while Wednesday, June 25th, through Sunday, June 30th, is only $80...plus membership ($10) for anyone over 12 years old. For more information, contact Michele Johnson, 419-666-1884, michele.johnson.nta@gmail.com. Important Camping & Parking Note: Each paid camper will receive one vehicle pass. No vehicle will be allowed into the grounds without a vehicle pass after the show begins on Thursday. Additional vehicles must be parked in the daily parking areas outside of the fairgrounds fence. Exhibitors and workers...be sure to pick up your vehicle pass at the secretary's office prior to Thursday. 1. There will be zero tolerance for non-handicap carts or operators in the flea market!!! 2. No utility trailers are permitted in camping areas. All utility trailer parking will be outside the fence. 3. No more than two cars/pickups are allowed at your camper, parked on your space only. Planning To Bring A Golf Cart Or Other Personal Vehicle To The Show? Be sure to check out our Revised Regulations. The National Threshers Association is recognized as a 501 (c) (3) organization by the Internal Revenue Service. Copyright © National Threshers Association. All Rights Reserved.